We announced a Limited Preview of Amazon WorkSpaces at last fall’s AWS re:Invent conference and I wrote a detailed blog post at that time. the cloud. It gives enterprise IT the power to meet the needs of a diverse user base by providing them with the ability to work wherever and whenever they want, while using the desktop or mobile device of their choice. During the Limited Preview, companies of all sizes tested Amazon WorkSpaces for applications that range from corporate desktops to engineering workstations. Although I rarely include customer quotes in my blog posts, the feedback that we received during the Limited Preview was really good and I decided to share it. Here a just a few of the testimonials that we received. 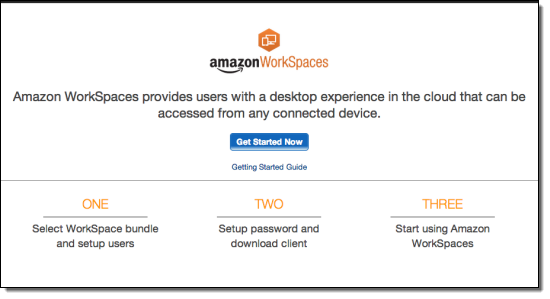 I am happy to announce that Amazon WorkSpaces is now available to all AWS customers and you can start using it today! You’ll need an AWS account, a PC or Mac to run the WorkSpaces client, and Internet connectivity (TCP on port 443 plus TCP and UDP on port 4172). You can also run the mobile version of the WorkSpaces client on iPad, Kindle Fire HDX, and Android tablets. In most organizations, an IT professional will be responsible for provisioning WorkSpaces for each user. In this blog post, “you” refers to this individual, and “your users” refers to the members of your organization that have access to Amazon WorkSpaces. After you download and install the WorkSpaces client for your device, you will have access to a complete Windows 7 experience in the cloud, with persistent storage, bundled utilities and productivity applications, and access to files and other resources on the corporate intranet. If you have an existing Active Directory domain, Amazon WorkSpaces can use it for user authentication and WorkSpace management. You can also choose to create a directory managed by Amazon WorkSpaces when you start using the service. As part of this launch we are also rolling out Amazon WorkSpaces Sync. The Sync client continuously, automatically, and securely backs up the documents that you create or edit in a WorkSpace to Amazon S3. You can also install the Sync client on existing client computers (PC or Mac) in order to have access to your data regardless of the environment that you are using. Use WorkSpaces Connect to integrate with an existing Active Directory domain on your corporate network. You will need to create a Virtual Private Cloud (VPC) and connect it to your network using AWS Direct Connect or a VPN connection. If you have an Active Directory Domain Controller (DC) running in your VPC, WorkSpaces Connect can use it. Have the WorkSpaces service provision and manage a directory for you within an existing Virtual Private Cloud. Instruct WorkSpaces to create a new Virtual Private Cloud and to launch a Cloud Directory within it. The next step is to provision one or more WorkSpace users. As part of this process you will select a hardware and software bundle for each new user. There are currently four WorkSpace bundles, with 1 or 2 virtual CPUs (vCPUs), 3.75 or 7.5 GiB of RAM, and 50 or 100 GB of storage. Prices range from $35 to $75 per WorkSpace per month. 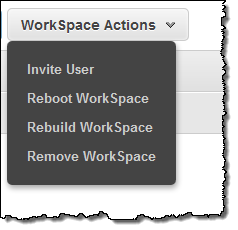 After you click the Provision WorkSpaces button, a WorkSpace will be created in 15 minutes or less and an email will be sent to each new user. 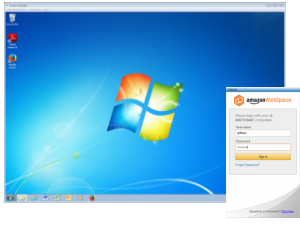 The email will invite the user to join WorkSpaces and will allow them to click through so that they can create a password and download a WorkSpaces client for their device. WorkSpaces with users drawn from an Active Directory domain can be managed using the same tools that you use to manage the other clients in the domain. 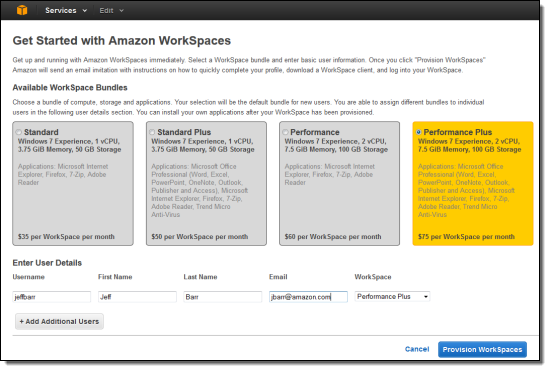 Amazon WorkSpaces is now available in the US East (Northern Virginia) and US West (Oregon) Regions. The Amazon WorkSpaces team is very interested in knowing more about your deployment plans for this cool new service. Please feel free to leave a comment or to post a note in the Amazon WorkSpaces Forum.